← Wop’s Hops – Sanford’s new Jewel and a Orlando Craft Beer Tour Must See! 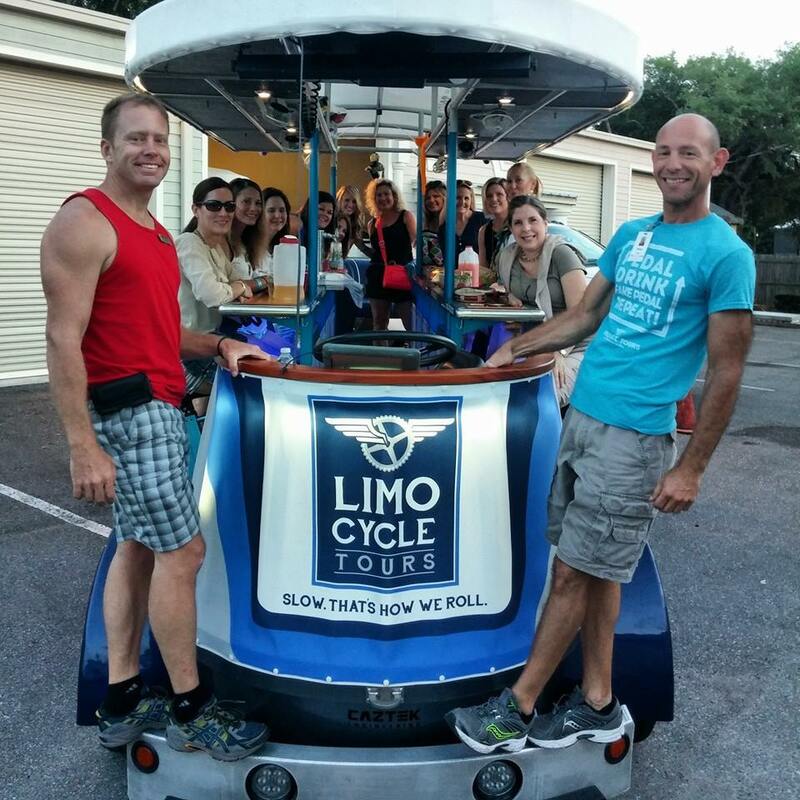 I can not say enough amazing things about the Limo Cycle in Sanford (but I am here to try)! They are a great chance to have some unique fun at a leisurely and untaxing few miles per hour. Did I mention you can drink? and Sing (oh No) and play awesome trivia games? Even kids parties and Pub Crawls! (though not at the same time.) They also do charity and we both partnered together to raise money for classroom technology. (enjoy the picture below!) I have been proud to work with them on many occasions but never had a chance to partake of a a drink. (always the bridesmaid and never the….) What matters to me is like the Florida Fun Shuttle experience the groups have always returned happy and I am proud to work with them and highly recommend them! Another mark of greatness is the fact that they will work with you on what you want to drink (even BYOB). They tailor your event like a fine suit! We are the same way, Cheers! This entry was posted in Beer In Florida, Brew Bus, Day Trips, Designated Driver, Evening excursions, Florida Breweries, Limo Cycle, Limo Cycle Tours, Micro Breweries, Orlando, Orlando Weekly, outings, Private Tour, Sanford, Services, Special Events, Tap Room, Tap Rooms, visit seminole and tagged beer, beer bus, beer in florida, beer tour, birthdays, brewer, Bucket list, Central Florida, central florida craft beer tour, college, Craft beer, Craft Beer tour, Florida craft beer, group transportation, Limo Cycle, Limo Cycle Tours, orlando brew tour, Visit Seminole. Bookmark the permalink.